The micro-blogging service plays an important role for communicating successfully, for example in critical countries such as Iran, Egypt or Libya. Sharing stories of freedom and organizing people has become part of Twitter’s success. Twitter Stories at stories.twitter.com talk about the less turbulent lifes of ordinary people. A single tweet, in 140 or fewer characters, can change whole lives. Some of the presented stories are introduced with well-done short intro movies. The Twitter users—“Tweeps”—decide what is interesting enough to spread the word about it. You like something you read? You will probably retweet it, thus sending the tweet to your own Twitter followers. If enough people do this, a snowball effect will start, causing a single tweet to reach hundreds of thousands of readers. Popular U.S. celebrities like Ashton Kutcher have more than eight million readers. Twitter Stories tell such stories, some in movies, some for reading. The movies are English, while the texts are translated to multiple languages, like German. Let’s take the example of Maureen Evans. She sends complete recipes as tweets. This means: She needs to watch the 140 characters limit, sometimes not an easy task. 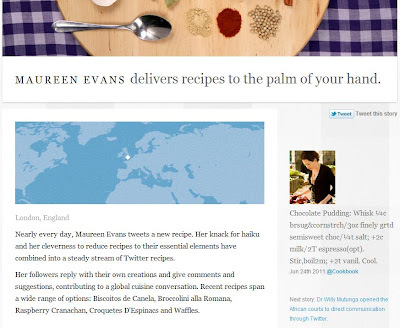 Nearly every day, Maureen tweets a new recipe. Her Haiku commitment and her talent to reduce recipes to their essential ingredients allow her to share recipes with others via Twitter. Her followers reply with their own creations and comments and thus participate in talking about recipes of the world. Some of Maureen’s recent recipes included Biscoitos de Canela, Broccolini alla Romana, Raspberry Cranachan, Croquettes D’Espinacs and Crêpes. Twitter Stories help to get what Twitter stands for. Getting loyal readers is not easy. Right after signing up for Twitter, you won’t have a single follower. But as you start following people, they will start following you back. And as you start writing about interesting things affecting or inspiring other people, the mentioned snowball effect will get you more followers. One thing to remember: Your texts on Twitter—“tweets”—are usually public: anybody may read what you write about. This includes search engines walking through the messages. It is also possible to show what a Twitter user wrote in the past, and when. With the time, a chronological timeline builds up, a history, a profile. Finally, you can also send photos via Twitter. These photos are then cached on servers, and a short URL is created for each photo. These web addresses can be embedded into tweets—and Twitter will show the images. Twitter Stories prove one thing: Twitter is a phenomenon of the Web. To move things, you just know how to make use of it.